But then this gravy happened. Every now and then a recipe walks into your life that makes you put down your beer and go “whoa, that’s stupid awesome.” In this case it was my Dandy Blend, but I digress. I’m a Southern girl (raised by very midwestern parents, but nonetheless) and I love my biscuits. I love them even more smothered in gravy. A long time ago (ok, five years ago), I even featured a mushroom gravy recipe on the site which was pretty good. Not mindblowing, but passable for a vegan biscuit gravy. But this gravy blows all other experiences, vegan and not, out of the water. Awhile ago I was gifted a copy of The Southern Foodways Alliance Community Cookbook–a collection of regional Southern recipes collected over the years by contributors and researchers who are members of the Southern Foodways Alliance (SFA for short). The SFA was founded in 1999 by John Egerton with the goal to document and archive Southern food culture. Directed by John T. Edge (if you’re at all familiar with Southern food today, then you’re familiar with him), it’s HQed at the University of Mississippi and is hands down one of the main reasons I regret not accepting my position to study poetry and nonfiction there. Working with the SFA would have been incredible. The SFA cookbook is chock full of incredibly non-vegan recipes like Country Captain and Root Beer Glazed Ham, but plenty of veganizable recipes (can we say Carrot Soup with Bourbon and Ginger or Gumbo z’Herbes, anyone?) abound as well. 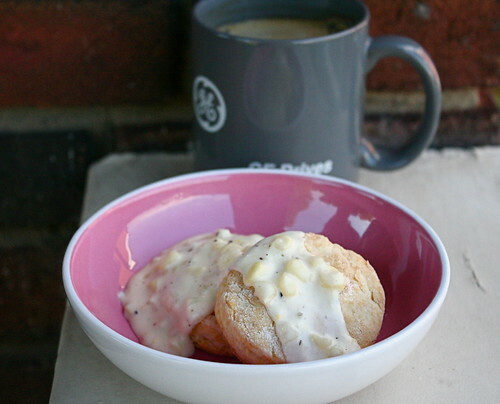 Given my obsession with biscuits and gravy and the fact that I’d just picked up some sweet, white corn at the farmers market, I knew that something called Roan Mountain Corn Gravy needed to make it to the table as soon as possible. This recipe can be traced to Carter County, Tennessee. That’s where, in the early years of the twentieth century, the late Florence Graybeal perfected it. More recently, her daughter, Margaret Propst, was the cook with her hand on the skillet full of corn gravy. In 2005, she passed away. Mrs. Propst worked as a teacher most of her life, instructing high school students, alternately, in chemistry and home economics. She reportedly served corn gravy for breakfast, lunch, and dinner, and she preferred white corn such as Silver Queen, although she occasionally fell back on yellow or even canned. In short, this recipe is simply gravy with corn. In it’s true essence, though, it’s a sweet bite of summer on a biscuit. Slightly sweeter than most gravies and without any grease, I fell in love with the slight crunch of each kernel, the back bite of black pepper tempered with almond milk. I’m ashamed to admit that I ate an entire half recipe of Vegan with a Vengeance’s Baking Powder Biscuits and didn’t go for an hour long run afterward. This decadence? I’ll be working it off all week. But trust me, it was worth it. Cut the corn kernels from the cobs into a large saucepan. Use the back of a knife or a small spoon to scrape the remaining corn and [corn] milk into the saucepan. If the cobs are juicy, squeeze the remaining milk into the pan as well. Stir in the tepid water, sugar, salt, pepper, and Earth Balance. Cook over medium heat until the corn is tender, about 5 minutes. In a small bowl, stir together the flour and cold water, mixing until smooth. Bring the corn mixture to a boil and gradually stir in the flour slurry. Cook, stirring, until the raw flour taste is gone and the gravy thickens, about 10 minutes. The gravy should be slightly thick, but not as thick as cream-style corn. This recipe is so perfect – we have 4 ears of corn from our CSA in the fridge that I need to cook up today or tomorrow. Do you think olive oil would work instead of Earth Balance? EB is off the menu for me this month, because of October Unprocessed. Olive oil should definitely work (or coconut–mmm)! I was about to say this too haha. You’ll lose some of the salty flavor though. I’m going to make this with shelf stable unsweetened coconut milk since i really hate how almond milk tastes in cooked foods. I’ll report back. Yes! Coconut milk sounds awesome with it–let me know how it goes!! Oh me too. (Hating almond milk in gravy/etc). Gonna just use unsweetened soymilk. This does look great. First I’ll have to find a biscuit recipe worthy of the gravy! 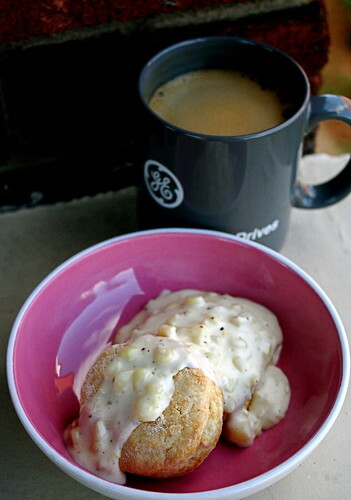 I had biscuits and gravy over the weekend too! It must be that time of year. 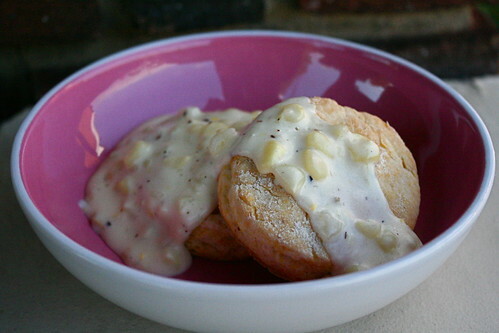 I love corn gravy. There is a recipe in the Veganomicon I riff on quite a bit. I’ve never seen corn in gravy! Then again, we aren’t the most gravy-centric household (side note: a gravy-centric household! OMG! I want to live there). Super interesting! I have four ears of corn in the fridge!! I AM MAKING THIS!! !